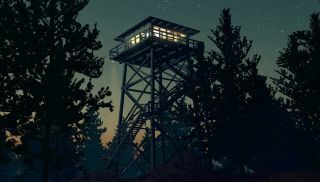 This, courtesy of IGN, is 17 minutes of footage from Campo Santo's Firewatch. In it, you see protagonist Henry do a spot of light orienteering, er, 'confiscate' some whisky, and have some charming back-and-forth banter with his supervisor. The tone seems considered and natural, and there's just a hint of mystery. Campo Santo, of course, is lead by the the former Telltale devs who headed up the first season of The Walking Dead. Evan interviewed Campo Santo's Jake Rodkin and Chris Remo at last year's PAX Prime. You can watch that discussion here.